If you veer out of your lane, the vehicle will provide you with an audible warning. It may also be possible to have the seat rumble to deliver warnings instead. 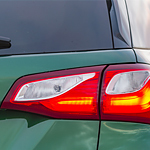 Another key safety feature is the intelligent headlight design. It will turn itself on in rainy or other unsafe weather conditions. When the vehicle passes another car or truck on the road, it will turn the headlights down from low beam from the high setting. Therefore, you don't have to grab for the headlight controls each time you pass a driver on the road.